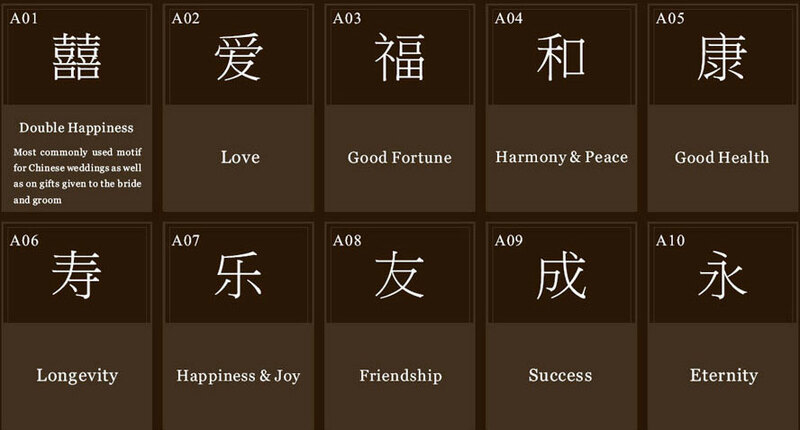 Add an oriental flavor with some of our carefully selected "hall of fame" Asian character symbols. These commonly used motifs were invented thousands of years ago. Each character symbol represents a heartfelt emotion, love or best wishes. "Double Happiness" symbol is classic for wedding chopsticks for a Chinese wedding. Other symbols that can be engraved include the symbols for love, good fortune, harmony & peace, good health, longevity, happiness & joy, success, and eternity. If you need translation or the Asian symbol you wish to engrave is not included below, please feel free to call or email us. Each Asian Symbol comes with a preassigned code, such as A01, A02 and so on, which is shown at the left-hand top corner of each Symbol. When filling out your order form, please use the codes to indicate which Symbol(s) you choose and their position(s). ~ Asian Symbol Engraving Fee ~ $2 / each Asian Symbol engrave (E.g. If you'd like to engrave the same Symbol twice, that will be $4. If you'd like to engrave the same Symbol 3 times, that will be $6). For large quantity orders, please select a flat fee charge of $30 per Symbol. Return to HOMEPAGE to select Personalized Chopsticks Type.